Looking for somewhere affordable to take your honey on a date? Or somewhere funky and delicious for a birthday dinner? The three restaurants I went to for dine out this week really rocked my tastebuds, and I recommend all of them. Cardero’s, Banana Leaf, and the Reef on Main Street. I tried Cardero’s restaurant for the first time for lunch last Monday. It really captured my heart. (Note, the way heart is not solely through my mouth, and/or my stomach). In my post last week I described all the things that make for my ideal dine out situation. I am not the pickiest person, but the vibe and the style of the restaurant and the service really matter to me. Not only is Cardero’s situated in a beautiful location right off of the seawall with a view of the ocean and mountains and all the boats in the harbour, the whole restaurant kind of feels like a giant ship inside! It is all dark wood with little model ships, and funky art everywhere, and ship paraphernalia. It is fun to look around in! The servers, both men and women, have uniforms with ties (and, have I mentioned, I love it when women wear ties?!) and their ties have teeny weensy forks and knives on them! Okay, so I secretly want one for myself, but anyway… The service was fabulous, and the food fresh, and flavourful. 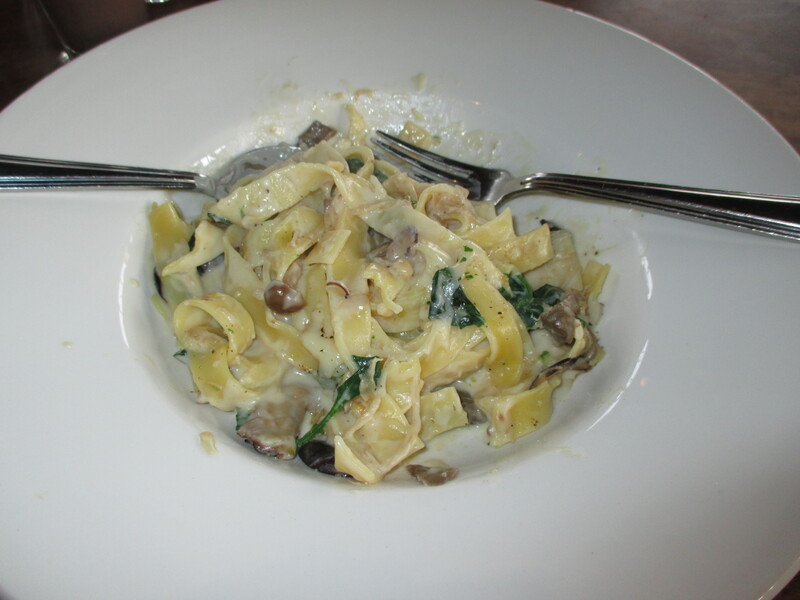 The pasta dish I tried tasted like the fettucini had been hand rolled that morning and was not at all overpowered by the delicate truffle cream, mushrooms, spinach and parmesan. << okay so it may have looked a little more elegant before I started eating it, but it smelled so good, I couldn’t wait until AFTER taking a picture! My salad with pear and goat cheese, dried cranberries, and walnuts was delightful, but you can’t really go wrong with that combination, can you?!? My dining partner had squid for her appetizer which had a nice zing to it, very well-spiced. Then, braised short ribs with goat cheese polenta and steamed vegetables. I couldn’t stop stealing bites off her plate, simply scrumptious! Next, we hit up Banana Leaf for a midweek Malaysian lunch, a restaurant that has been one of our Vancouver favourites for years. We decided to opt out of the dine out menu and go with the regular lunch taster menu instead. It still comes with an appetizer, main, and dessert, but is $18 per person instead of the dine out lunch price at $28. (the Dine out menu had a few more options, but was quite similar). Unfortunately, the food wasn’t up to its usual standards, normally we are blown away by the eloquent presentation and all the bold spices and never have any complaints! But this time, the Rendang beef, which I usually adore, was much tougher than usual, and the papaya salad was so acidic it was like trying to eat pure vinegar, so we chose not to eat at all! The seafood curry, coconut rice, and stir fried green beans were all delicious, but still didn’t wow us like the Banana Leaf usually does, perhaps the quality at this location (Robson) is not as great as the others, or maybe it was just due to the high volume of customers during the first week of Dine Out. 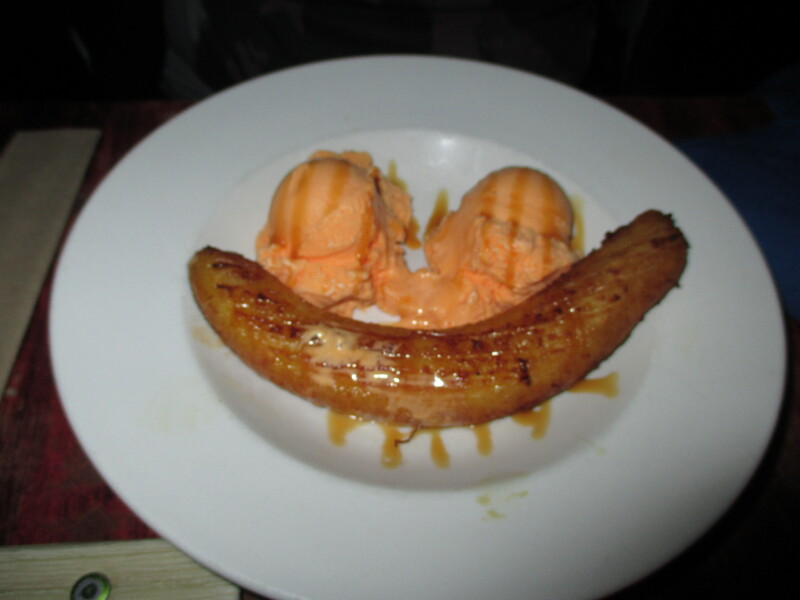 The desert of deep fried banana with vanilla ice-cream and caramel sauce was a little taste of heaven, and was the perfect size plate for two. 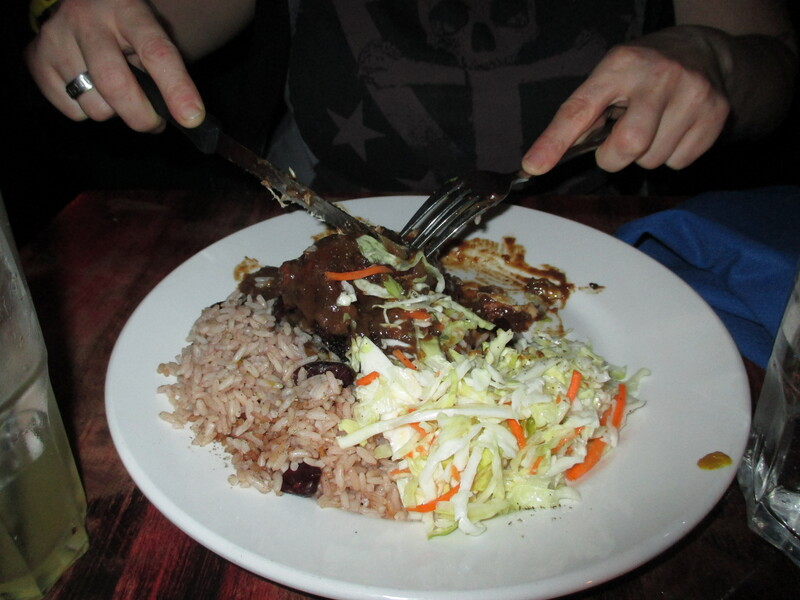 On Saturday night we went for dinner at the The Reef On Main which is truly the best Caribbean food in town! But, be prepared for SPICE! Love it, crave it, seek it at the Reef! I have been to both of the Reef’s Vancouver locations multiple times and have had much better results at the Reef on Main. The food quality and service has been exponentially better at the Reef on Main street than on Commercial Drive, I have no idea why! Although the Main street location is a little smaller, it has BIG personality. The walls are bright orange and the art be poppin’ just like the DJ. It is a fun place for a dinner date or a party. The cocktails are a plenty, and they come with colourful little swords and umbrellas! SCORE! From their dine out menu we tried both of the appetizer options: plantain chips with spicy mayo, and the macaroni and cheese sticks with spicy ketchup. Both were amazing! 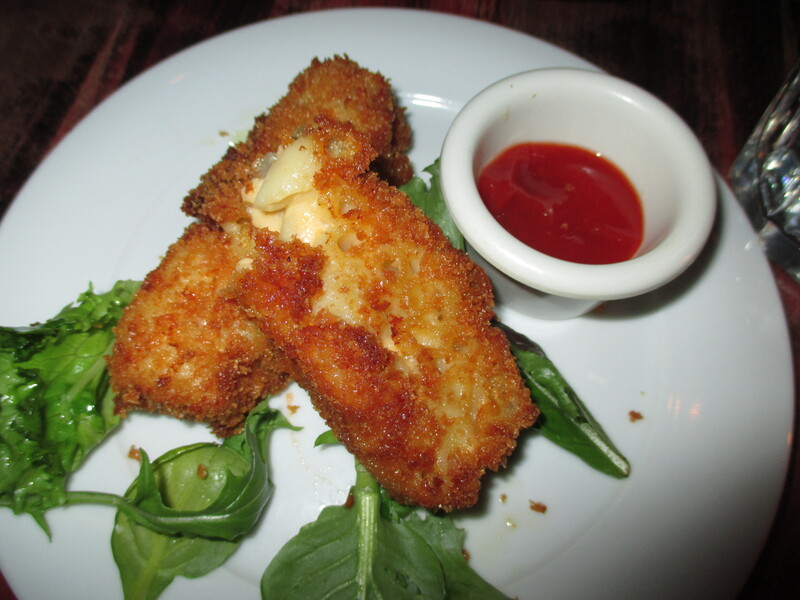 The Reef’s Mac n’ Cheese Sticks! 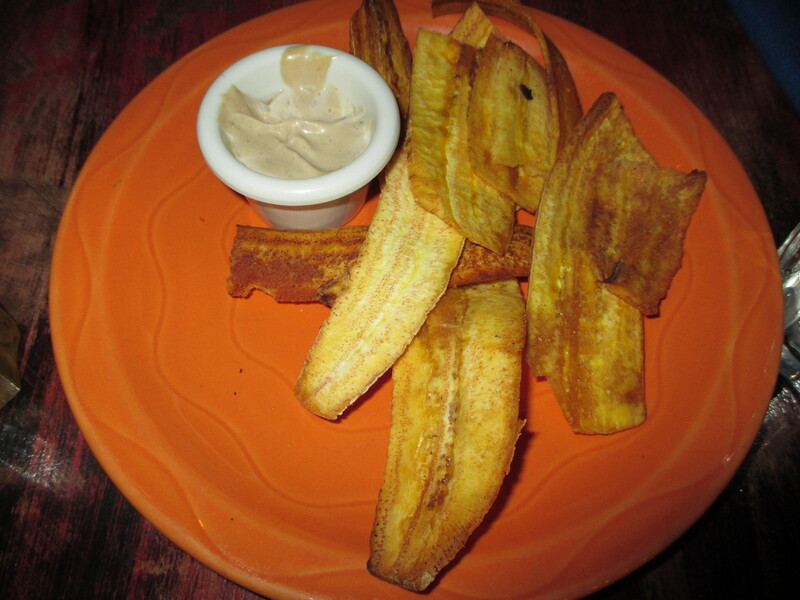 The Reef’s Plantain Chips! Om nom nom! 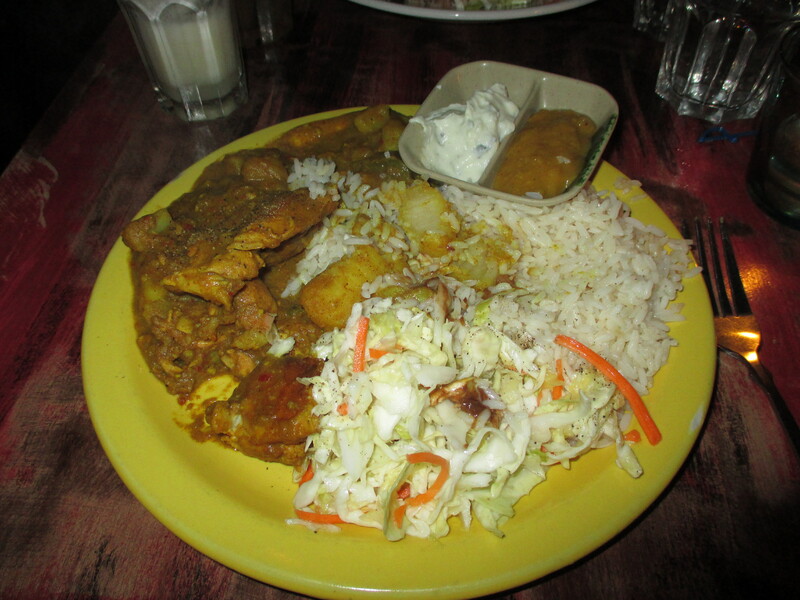 For the mains we chose the carribean curry blend with chicken and potato and also the Jerk chicken. A GIANT plate of curry! mmm Jerk chicken, munch munch! Both were HELLA spicy, but the tangy coleslaw helped cut the spice quite nicely as did the drinks (Kahlua and milk anyone?!). It may not look that amazing, or sound that amazing. But it is like a coconut creme brûlée with a pie crust- genius! Sweet, creamy, and wondrous. Mouthgasm worthy for sure. 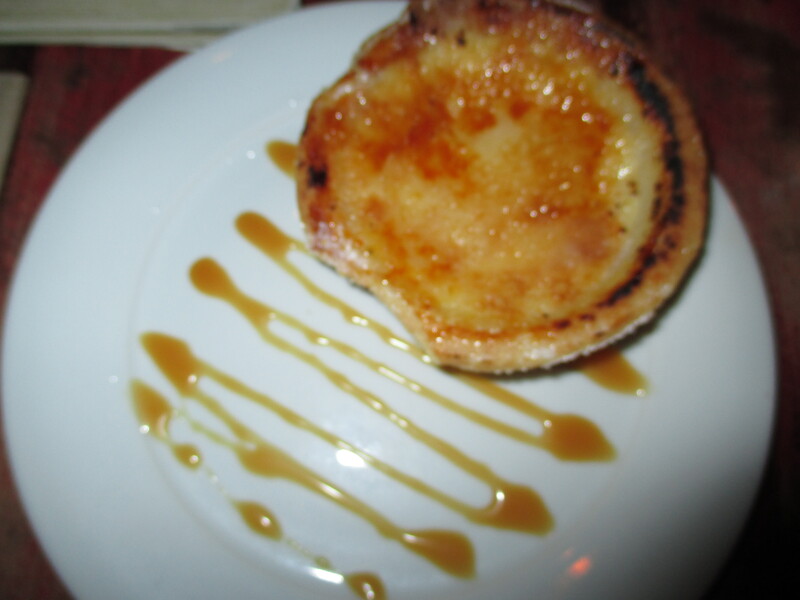 This week I will only be trying one more restaurant for Dine out Vancouver 2014, and that is because I’ve always wanted to try it but cannot usually afford it’s ridiculously STEEP prices: on Saturday night we will be trying Cin Cin’s on Robson. I shall report back!